On December 23, 2015, a hazardous waste handler injured his abdomen while moving drums. His company stored drums in a cramped storage area. The worker stretched awkwardly to grab the far lip of a 55-gallon (208-liter) drum weighing 425 pounds (193 kilograms). While moving the drum a few inches to maneuver a dolly under it, he felt a twinge in his lower abdomen. Despite some discomfort, he continued with his activities. The next task was moving a 30-gallon (114-liter) drum containing 33 pounds (15 kilograms) of waste. As he lifted the drum, the worker heard a popping noise and felt a lump in his abdomen. Medical staff diagnosed a hernia. The injury required surgery. This incident is only one of many where poor ergonomics and drum handling led to serious injury. Drums are heavy – a 55-gallon drum of lubricating oil weighs an estimated 450 pounds. Justrite drum cabinets and accessories make storing and handling drums easy and safe. 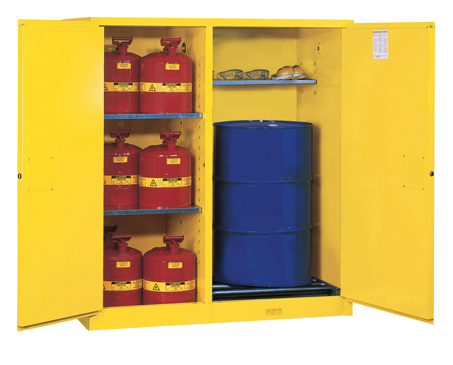 Justrite heavy-duty drum safety cabinets store larger quantities of flammable liquids. All cabinets feature reinforced liquid-tight sumps to contain spills. Select the drum storage orientation that best suits your facility's needs. Sure-Grip EX Vertical Drum Safety Cabinets allow safe storage for 30- to 55-gallon (110- to 200-liter) drums. An adjustable shelf provides enough head space to accommodate a drum with a pump or funnel installed. The cabinet functions as a pumping or waste accumulation station. To store safety cans and drums within a single cabinet, use Sure-Grip EX Double-Duty Drum Safety Cabinets. 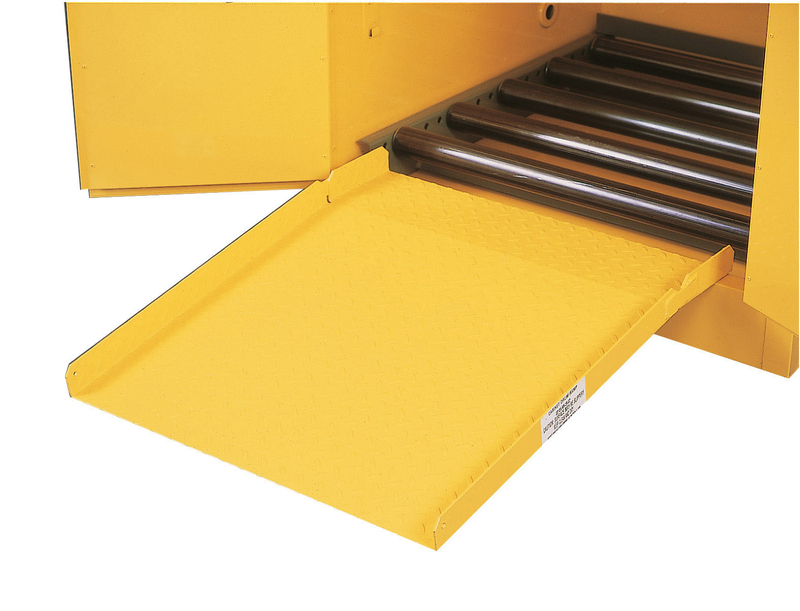 For gravity-flow dispensing operations or horizontal drum storage, use Sure-Grip EX Horizontal Drum Safety Cabinets. There is space for a drip tray and tracks to guide a drum cradle into position. 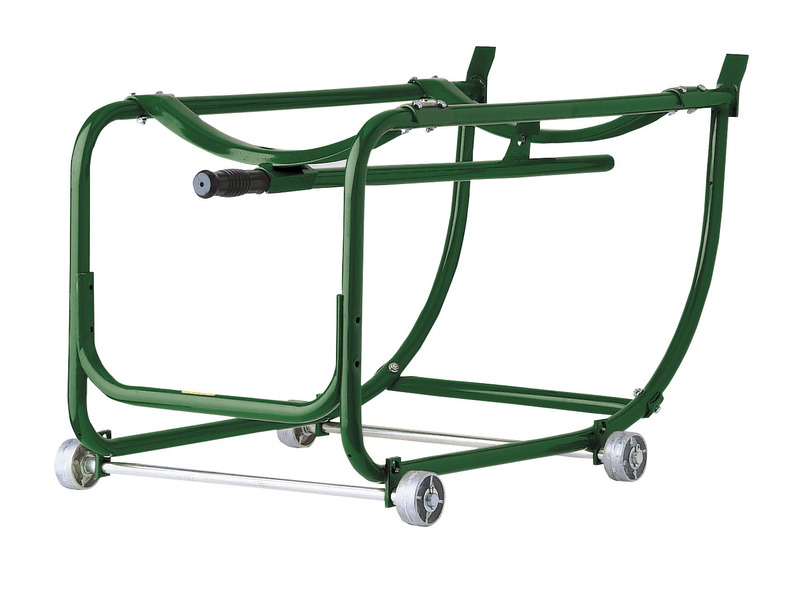 Justrite supplies cabinet ramps to easily load drums into a safety cabinet using a cart. Ramps fit over the sill to secure them in place. Their surface has a tread design for traction and can handle loads up to 750 pounds (340 kilograms). Drum rollers fit into vertical drum storage cabinets. They make it easy to maneuver heavy drums, without having to lift from an awkward position. A wheeled drum cradle holds a drum in the horizontal position for gravity-flow dispensing. They fit directly into the horizontal drum safety cabinets and can accommodate 55-gallon drums weighing up to 600 pounds (272 kilograms). When it comes to storing larger quantities of flammables liquids, trust the experts at Justrite. Our drum safety cabinets for flammables are available in many styles and sizes. Add accessories to make handling drums easier for employees and to prevent workplace injuries.